Does your organization require visitors to sign in upon arrival? 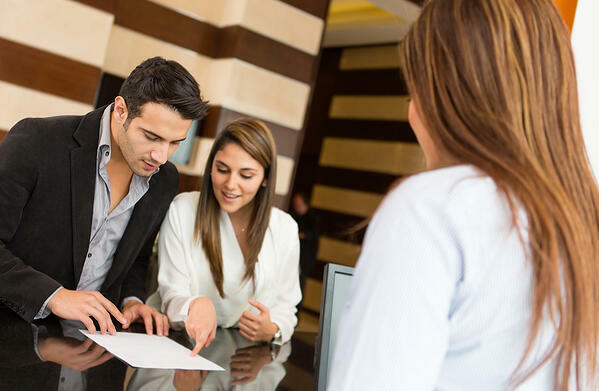 Every organization, and even individual offices within, has different guidelines surrounding guests and whether or not signing guests in is part of their visitor management system. In Parts of this series detailing the visitor management process, we described different ways to greet and identify your guests. Once you’ve identified which type of person or group is standing in your lobby, it is time to determine how much of the check-in process they are required to complete. Whether or not you have visitors sign a paper or digital visitor logbook will depend largely on the rules or customs of your organization, but there are definite benefits to requiring visitors to check in. In today’s modern world, office security is a higher priority than ever before. Schools, government buildings, large firms and factories all have reasons for knowing who is inside their facilities. And while businesses might like to maintain an open-campus type policy when it comes to visitors, that also makes them less secure. Visitors are wild cards. Security best practices require visitors to sign in, which adds a first layer of protection from would-be criminals – people who would harm people or steal data – by causing them to have to think twice about leaving a trail of evidence. Many organizations require employees to wear or carry identification that doubles as electronic access keys for buildings. Visitors might also need visitor badges in order to access areas, or simply for identification. A visitor photograph taken on site. It might seem slightly counter-intuitive, but having visitors sign in can actually help them feel more welcome. While some visitors may be frustrated by having to jump through hoops, it is also a signal that your organization has taken visitors into consideration, and it gives guests the knowledge that they’ve come to the right place. When a guest signs in, they know you are aware of their presence and therefore they are less likely to be left wandering around. Also, if visitor badges are part of the sign-in process, you can train your employees to keep an eye out for those visitors who might need a little extra help. Guests often find themselves lost in an unfamiliar location, especially if your building has a lot of twists, turns and levels. Visitor badges give employees the immediate knowledge that the people wearing them are supposed to be in the building, but may not be familiar with the layout. Not every organization is super-sensitive to security, and maybe not every visitor who comes in will be required to sign in. When thinking about your organization and its security needs, you’ll want to think about what your goals are, and what happens in your visitor management process. In Part Six of this series, we will discuss the benefits of keeping a visitor registration log that includes all guests, but here are some possible questions to consider. Do delivery personnel need to sign in? Will they go beyond the lobby? If not, then signing in may not be necessary. Or, you may require less information for delivery people. How much access will the person have? Could they see or hear sensitive information or encounter semi-dangerous manufacturing equipment? If so, they might need to sign a non-disclosure agreement or a waiver. Such documents can be handled during the sign-in process with an e-signature app. Does your organization want or need to know who is in the building at all times? If yes, then having every person sign in is important. Some organization may not; perhaps you don’t need to know about the visit from an employee’s spouse or the pizza delivery person. Do you have a skilled dedicated receptionist to help visitors find their way? If the answer is no, then an electronic check-in kiosk has the benefit of both signing in visitors and helping to move them along in the process. Otherwise, they may very well be lost from the start. Whatever process you choose for signing in guests, visitors will appreciate any steps you take to make the experience easy. Take the time to plan ahead to determine your security needs and how best to make guests feel welcome. An efficient visitor sign-in process shows your guests that they are not just an afterthought, but rather an integrated part of a well-functioning workplace.